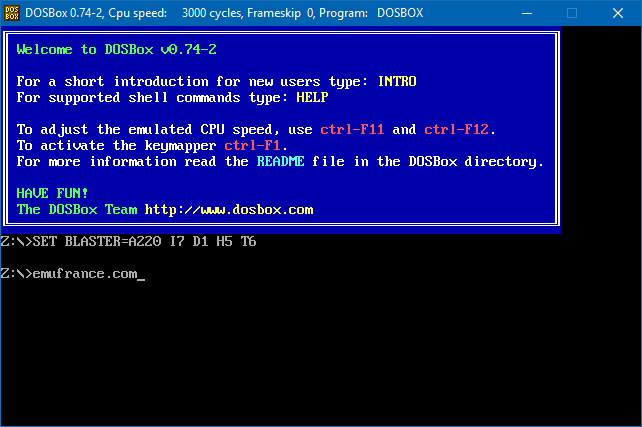 DOSBox est un émulateur PC (286 à 486) utilisant le système d’exploitation DOS. Il fonctionne sous Windows et est très pratique pour lancer des vieux jeux Dos qui ne tourne plus chez vous. Des builds alternatifs basés sur les dernières sources SVN en cours de développements sont disponibles ici. Notez qu’il s’agit du véritable DosBox qui va revenir bientôt avec une prochaine version (hors maintenance) incluant tous les patchs et améliorations SVN de ces dernières années ! – Rewrite auto/max cycles algorithm to work better with windows 7, other OSes might benefit as well. – Update 64bit recompiler to work on OSX and Linux. – Several improvements to make the recompilers work with newer compilers and add some workarounds about clang confusing itself. – Fix several variables being the wrong size in the recompiler. – Reduce overhead of the Mac version with a lot. Results in a speed increase. – Replace NV_PixelDataRange with the more common ARB_PixelBufferObject extension. Should help with output=opengl. – Reuse graphics window if possible instead of always creating a new one!
. support WINE style namemangling.
. allow Z:\ to be moved to a different drive. – Fix automake and autoconf problems. – Fix problems related to packed struct layouts. – Fix compilation on gcc 4.4 and gcc 4.6.1. – Fix compilation with -DPIC. – Hopefully fix crash on shutdown, when unknown condition is encountered. – Fix -lto with gcc. – Fix clang compliation with asm fpu core. – Fix mapper crash on startup and when changing the mapper key. – Fix compilation in VS2015. – Fix compilation on mingw64. – Fix compilation on Frisbee and newer clang. – Fix compilation machines that have X11 libraries installed, but use a SDL without X11.
. Not being aware of when only the refresh rate changed. – Fix call order when bitshifting the return order (VS C /O2 builds). – Fix sign-extension error in S3 draw funcion, i.e. win3.1 analog clock. – Fix expanddot not caring about the size of the inputbuffer. – Some fixes for the debugger related to starting a program through debug.com. – Bring OS/2 port code up to date. – Reduce the amount of warning when compiling with quite a bit. – Allow 15/26/32 bits input to the opengl output. – Add cmd-q as exit key for macs. – Fix icon and titlebar on very old setups. – Fix off by one display size calculation errors with very large displays. – Fix out of bounds access the unused byte in the 32 bit colour value of the hardware mouse cursor pixel was affected. – Fix depreciated warnings on Mac, allow soundfont loading for coreaudio. – Keep repeating a pressed key if another key was unpressed. – Fix crash on OS X related to putting junk in the titlebar. – Extend fullresolution=0x0 to work on Linux and Mac. – Change gameblaster and tandy sound core to latest mame version. – Improve numlock and capslock support on Linux and Macs. Still not perfect on Windows. – Added even more code to workaround Windows behaving weirdly with alt-tab.